Easy to mount power sockets, to be mounted on a DIN rail, for use when external equipment needs to be plugged in. 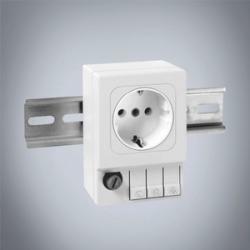 DIN rail mounted electrical socket. Pressure clamp connection for easy and quick wiring. 3 pressure clamps for stranded and rigid wire 0.5-2.5 mm². Integrated fuse 6,3,A 5x20 mm.